Yeah, yeah, it’s Thursday, I know. This week is kind of wonky: Cole is off from school, but Adam isn’t – he was supposed to, but the school district had to take the days back after Hurricane Sandy. I have grown attached to preschool! Anyway, Thursday is the new Wednesday. Get on board – or don’t. That’s okay, too. 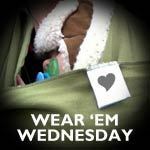 Some of you might remember that our love for babywearing started with our Moby wrap when Cole was tiny and never stopped crying needed some extra attention. It was a life saver that allowed me to attend to him without my arms dropping off from exhaustion. From his snuggly spot in the stretchy wrap, Cole came with me *everywhere. * He spent nearly all of his first 6 months in the Moby, and it was one of the first things I packed in my hospital bag when preparing for Lulu. 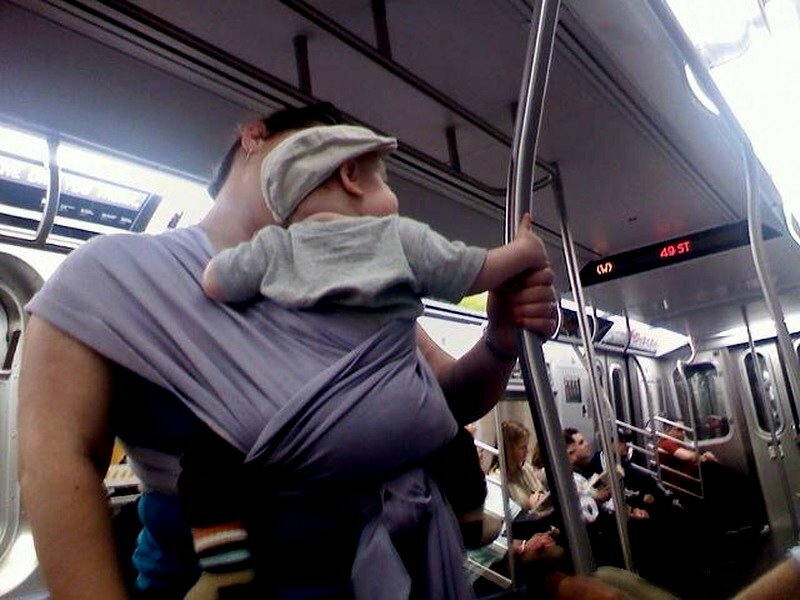 Unfortunately, stretchy wraps are not great once babies get bigger, and we left our Moby behind in favor of ring slings and soft structured carriers more suited to heavier kids. Guess what, though? Moby has come out with their own soft structured carrier! As soon as I found out about it, I knew I wanted to try out the Moby Go! The GO is a perfect carrier to graduate from the stretchy wrap to, and with an upper weight limit of 45 pounds, it could be the last carrier you’ll need. Last week, I got the chance to put the GO to the test – I was planning a trip into the city with both kids and knew I would not want to schlep the stroller along with the diaper bag and coats, etc. I am SO happy with that decision – we took the train in, and transferred in Secaucus. We went up and down multiple sets of stairs and escalators; it would have been a nightmare without a carrier! If you have been to our house, you have seen the HUGE pile of carriers in our dining room; I have an addiction. I have several other soft structured carriers in my collection, and the biggest difference I noticed right away with the GO was that it seemed a bit more flexible straight out of the box. The fabric for the main body seemed a little thinner so it was much more moldable and the unpadded straps were super comfy. I prefer carriers that cross in the back, so it was nice to have that as a feature of this SSC. Putting it on is intuitive, and the buckles are at a position on the sides that makes them really easy to connect. 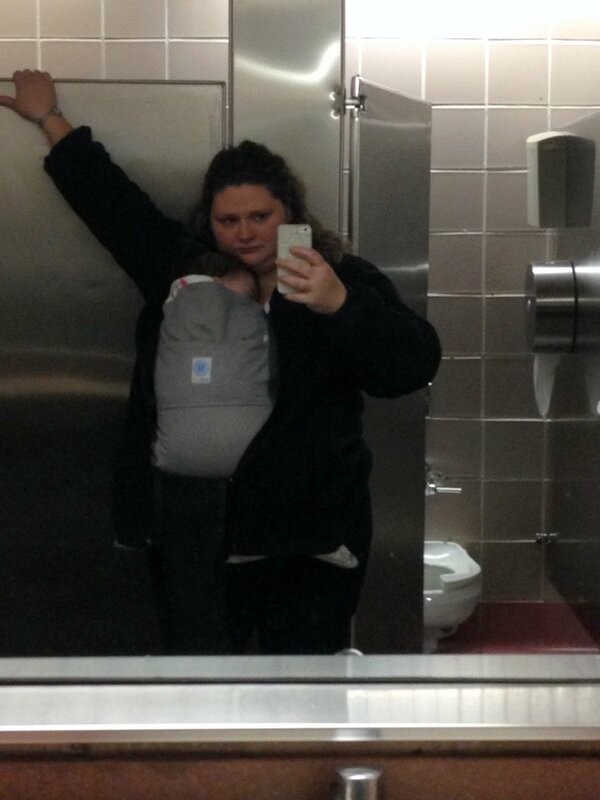 SUPER klassy selfie while waiting for Cole to come out of the bathroom in Penn Station. Lulu is 13 months old, and no lightweight at over 20 pounds, but I wore her for the entire day – over 5 hours – without any discomfort at all. She snuggled right in as soon as I strapped her in, and was so comfy that she took an EPIC nap. She fell asleep after lunch and stayed asleep all the way home! I really like the Moby GO, and I felt like Lulu was happy and secure, but there were two aspects that I might change given the opportunity. First, I am so used to doing a back carry that I miss the option; it’s a trade off for the nice wrap-style cross behind straps, which are super comfortable. Second, I wasn’t a huge fan of the hood design. I’m used to hoods that can be attached to the straps as a head support/privacy cover after the baby has fallen asleep, and the Moby GO has a hoody design. It was a little big for Lulu so she didn’t want it on while she was awake, and there wasn’t much reason to put it on after she fell asleep since it didn’t offer any head support. I would lose the hood and just use the pocket for small items – keys, and a credit card for quick trips maybe? Luckily, the hood is attached with a zipper and can be removed, leaving that pocket open. Overall, we really like the GO – if you love your Moby wrap, wearing your baby snuggled in front, and are looking for an option once your baby outgrows it, the Go is a great choice. Moby sent us the Go to try out, but they did not write our post. I wore Lulu all day all by myself, and formed my own opinions. AHAHAHAHAHA at your bathroom selfie. I love me my Moby. The Go version looks comfy! 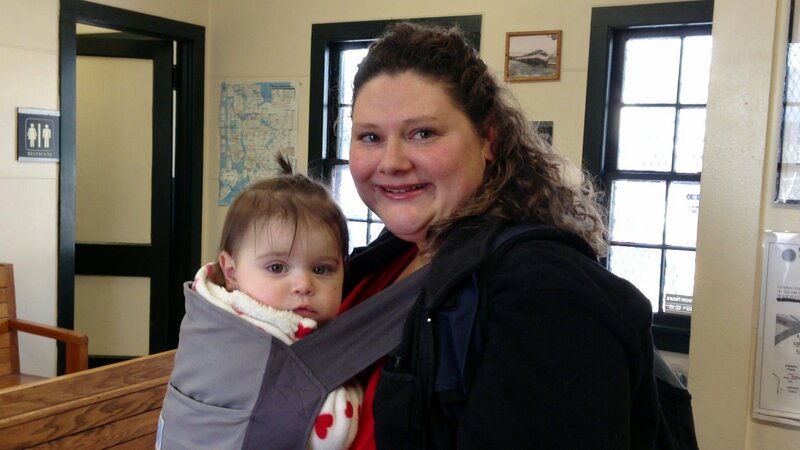 I was pleasantly surprised – I definitely am more used to back carries now that the kids are bigger, and it was nice to cuddle with her on front all day. I’m so impressed you wear her all day and that cold then walks your kids are so well behaved like that! Bwahahahahahahahahaha! I’m glad we’re giving that illusion!